Bradford on Avon bridge hazard? Residents are not so willing to go a little out of their way and use St Margaret's bridge, which is is ideally located adjacent to a car park by the railway station. What many residents want is a new bridge which will cost over a million pounds, a mere trifle, and to hell with filling the potholes. The two proposals, or is it three? Include a conservative design (ie. in keeping with the ancient setting) and a modern design; the third option is no bridge! 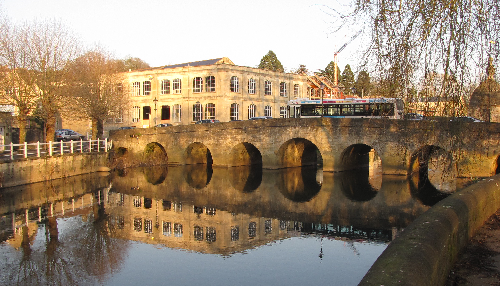 I have no objection to modern design but I don't think that a modern design bridge or any other modern building is appropriate in Bradford on Avon without considerable reflection on the manner in which such a development could harm the ancient environment. 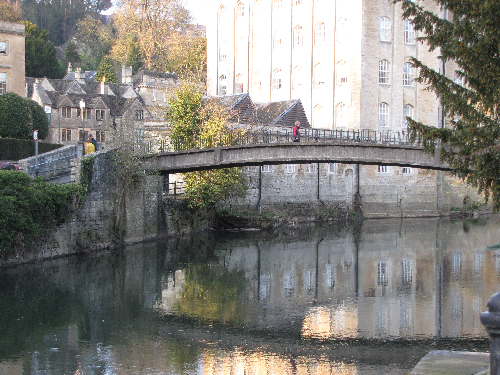 Bradford on Avon is not Venice but it is well worthwhile exploring on foot. There are two sides to the town bridge and everyone is agreed that any proposed new bridge should not be located close to the bridge on the western side as that would of course destroy the view to the left. There are no public locations to the east of the bridge that provide a view of Bradford and the town's bridge. This is surely wrong why are substantial lengths of the river Avon inaccessible to the public? Who owns them? And why should we have to accept that? However the view below, from the east side would also be affected by the proximity of the proposed bridge whether it is of cable stayed design or not.. The view of the town bridge from the eastern side is. even in early spring, partly obscured by wild shrubs growing out of the river bank. As a photographer I usually carry pruning shears for removing extraneous material from a view but forgot them today. A unique view from the eastern side of the town bridge .is of the blind house that forms part of the bridge. This view is really spoilt by the shrub or small tree, in the summer it would be hardly visible at all. The I think that the proposed new bridge would be so close to this venerable relic that it would really detract from its spirit... . 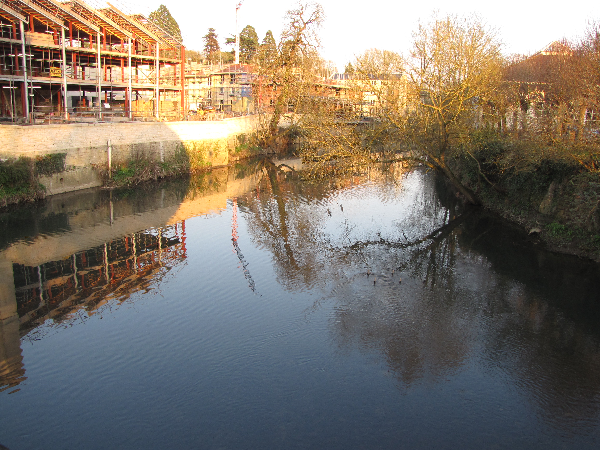 The photograph below was taken looking east from the town bridge. This view would disappear if a foot bridge was built close to the bridge. I understand that the location of the approved cable stay bridge would be much further away. Unfortunately, unless the foot bridge is located close to the existing town people will tend to not use it in preference to using the town bridge. In which case does it make sense to spend such a huge sum of money? A new bridge costing over a million pounds would mean calculating bridge life at 120 years a sum of over £8,000 a year plus interest. St Margaret's bridge is further away than the proposed new foot bridge, but it is there and I suppose paid for. The question is who needs another foot bridge? Why should residents put up with the continual intimidation by motorised traffic? Is it possible to control traffic using the bridge, yes. Why not think seriously about how to reduce traffic speed over Bradford's town bridge. At present, unless the pedestrian crossing which is controlled by traffic lights is showing red it is not possible to safely cross the road by the bridge and only then if the traffic coming the other way gives way. We could at least have two sets of lights and if necessary a one way system set up. At least when the traffic is stopped people will have time to cross the road. Hasn't this proposal for another foot bridge arisen along with the new Kingston mill development? Why was this development given approval when there is virtually no work in the area unless of course the new dwelling owners will be mainly retired people? A major part of the existing problem is that the pavements are too narrow, two people cannot easily pass each other, even at slow speeds passing motor vehicles make crossing the bridge uncomfortable and dangerous. One possibility, there are others that I have discussed in an earlier article below, which has not been discussed is to widen the pavement by jetting out the wall on the west side of the bridge. This would involve partially altering the design off a grade II ancient monument (?) but can be carried out using stone and in such a way as to enhance the bridge. The links below are to more photographs in Bradford on Avon and to Frome Somerset's new cable-stayed Jenson Button footbridge. I have also included photos of the existing footbridge which is no shorter than the new cable-stayed bridge. The new bridge cost in excess of £200,000 and replaced a Bailey type bridge that also carried road traffic into the town's car park. Frome's town bridge is not as grand as Bradford's but is interesting as it has buildings over it on one side. An old wall had been removed to allow for a wider pavement with railings instead of a wall. The cable-stayed footbridge has a smaller column than the planned Bradford on Avon bridge. The whole bridge is very well made and is not out of place in its environment. However, apart from celebrating Jenson Button's MBE victory in Formula 1 in 2009 I see no real justification to have that style of bridge. And in fact, a group of Frome residents tried to get the Bailey bridge listed! The extract below is from Wikipedia. What is notable about this type of cable stayed bridge is that the design is, in engineering terms, far more radical in that it must neutralise considerably more forces. 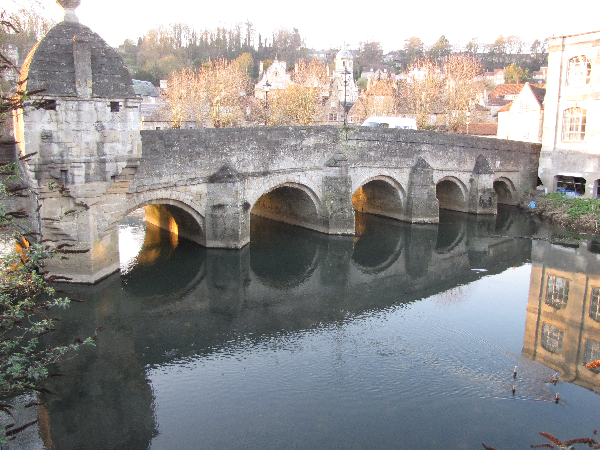 Cantilever-spar cable-stayed bridge for Bradford on Avon? Far more radical in its structure, the Redding, California, Sundial Bridge is a pedestrian bridge that uses a single cantilever spar on one side of the span, with cables on one side only to support the bridge deck. Unlike the other cable-stayed types shown this bridge exerts considerable overturning force upon its foundation and the spar must resist the bending caused by the cables, as the cable forces are not balanced by opposing cables. The spar of this particular bridge forms the gnomon of a large garden sundial. Related bridges by the architect Santiago Calatrava include the Puente del Alamillo (1992), Puente de la Mujer (2001), and Chords Bridge (2008).